Is Microsoft finally burying the sets tested in previous Insider Previews of Windows 10? Now we have a semi-officially confirmation of the farewell to this feature..
[German]Occasionally, Windows users are facing an update error 0x80246001 and the update install process aborts. This can occur on Windows 7 to Windows 10, but also on Microsoft Office. Here is some information about this error. 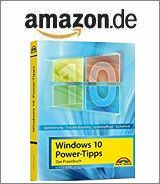 [German]It happened during the last time, first people have received the announced notification in Windows 7 that support for this operating system will end on January 14, 2020. Microsoft has just announced MDATP as a Threat & Vulnerability Management solution and released it as a public preview. Threat & Vulnerability Management is a new Microsoft Defender ATP component. [German]One week after Microsoft released Windows security updates causing install issues, the situation for victims are not clear. Here’s an overview, what we know so far. Addendum: Avira has updated its knowledge base article, I’ve added that information.